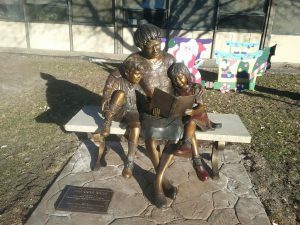 Last December 21, the dedication for our new bronze art took place. The ceremony was well attended, with brief remarks from Dr. Embury, Mayor Young, PCDC Exec. Director Tillery, County Commissioner Tom Nutt, and Library Director Burris, with special remarks by Ty Swan about the women of his family that were the inspiration and focus of this memorial. The art celebrates how good books are shared within families – be sure to share your favorite stories with your family at every opportunity!